A family company with its roots in the industry. It is the pioneering spirit which drives Ostermann to continuously create innovation. 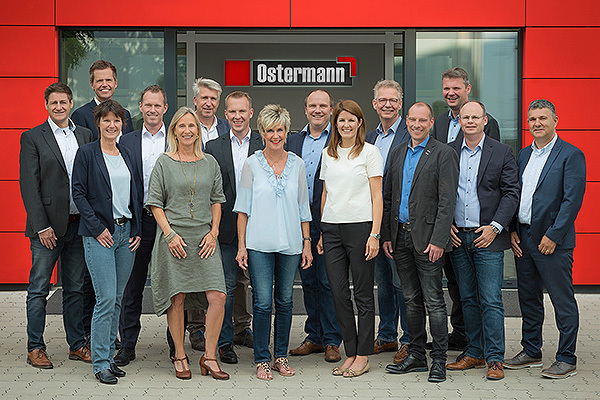 My team and I deliberately search for things which will simplify our customers work and improve the Ostermann service.The innovative thinking and service-orientated attitude, as well as the friendly cooperation, are all characteristics of a traditional family business. Four words that characterise the Ostermann corporate culture: Service, diversity, speed and family. This strive for improvement has brought us to where we are now; highly favoured by our customers and at the top of the European trade edging market. Contributing to our success are our latest services e.g. offering the whole Ostermann range as laser compatible edgings, fast delivery service on all our stock items, supplying in small quantities such as from 1 metre and also the wide variety of our product range. Managing Director Dagmar Daxenberger with the leadership team (subsidiaries and departmental).